Crystal Sands, an intimate, three-story, quiet property. These two gulf-front, low-rise condominium buildings are located in Destin's Crystal Beach area. The unit that faces the dazzling, white, sand beaches views directly on the Gulf of Mexico. Spacious and private, decorated with comfort in mind. The condominium buildings are located near the heart of Destin. You will find lots to do both day and night. Crystal Sands is one of the special places that you want to keep to yourself yet can't stop to talk about. You deserve the best and the best is Crystal Sands on the beach. Do yourself a favor and treat yourself like a king or a queen, lay down on the beach and just be lazy. Come to the sugar, white beaches of the Emerald coast. Look out on the beautiful sun, surf, and sand not the parking lot or street. Listen to the waves not the passing traffic. Have breakfast on the balcony with only the sugar, white sand between you and the blue waters of Mexico. Sun and stroll on the beach or grab a wave runner and see how high you can fly. Crystal Sands is less than a mile from the famous designer's outlet mall, Silver Sands outlet mall. Do not forget about shopping there! My unit is on the second floor of the new building, east side establishment, building B. The unit has a master bedroom which has a king-size bed. There are two bunk beds in the hallways. The living room has a queen-size sleeper sofa. Crystal Sands is located away from the congestion of downtown Destin yet only minutes away from all the day and evening attraction. Its directly on the beach, close to restaurants and shopping stores and centers, yet away from the cities hustle and bustle, very private and isolated from crowds. Four friends and I stayed at this condo for our Spring Break. We loved the location and the condo looked very nice. It is right on the beach and very close to downtown. I highly recommend and will be staying here again! The owner is also very efficient in communication making it even easier. Thank you for your sincere comments.. Awesome place with an even better view. We had a great spring break in this unit. Beautiful view and it was extremely clean. I definitely would stay again. Affordable, quiet, clean stay ON THE BEACH! Great time on the beach close to anything a person might need...shopping, restaurants, etc. If maximum time on the beach and minimum time in the car is your goal, this is the best answer. 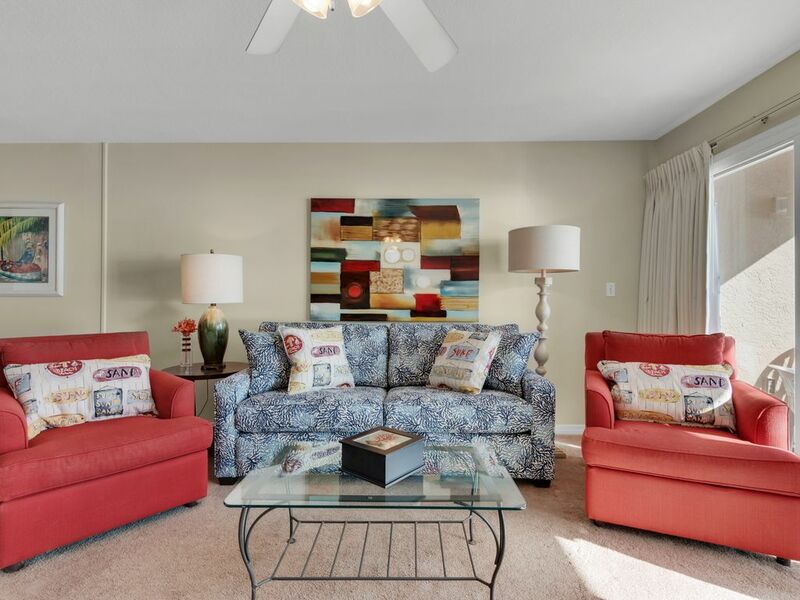 A comfortable, enjoyable beach front stay! The first impression was not a good one. The carpet is stained badly, the walls are dirty, the hair dryer is an electrical fire waiting to happen, half of the outlets don't hold a plug, and the view is beautiful but the plastic patio chairs are awful. Expecting guests to do the laundry should be included with the description of this property. Be aware you are expected to launder, fold and and return all towels before you check out at 10:00am. Don't ask for a late check out or early arrival because you will be charged for both. I was caught in the Hurricane Michael mess and this owner would not work with me at all. There are so many beautiful properties in this area and great owners. I suggest using a different one. This particular guest is nothing but a HATER!!!! The rest and the future reviews stand for both the property and the owner! At first she wanted to cancel her reservation 2 weeks out the hurricain, wanted me to refund due to the hurricain... even though Destin area did not sustain any damages nor hit as expected she insisted on canceling her trip. I simply told her as to what she signed up for booking the unit. The next day she changed her mind to keeping the reservation. She stayed at the property without complaining till the day before her departure asking for a late check out .. its on the website if you desire to check in early or out late there will be a charge for that as the unit is booked back to back its practically impossible for the cleaning crew to do a thourough job. she called me unsympathetic toward the hurricain victoms as she did not want to pay the late fee for $30.00 the irony was she was a vacationer not a victom of the hurricain GO FIGURE!! !